Mt. Hood, OR – While some ski regions enjoy deep early season snowfall this winter, other resorts continue to await cold and snow to fire up their lifts. In Oregon, Mt. Hood Meadows is putting lift operations on hold until more snow falls. 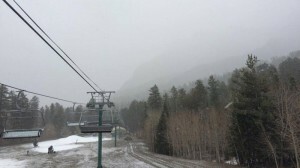 The resort had been operating its Buttercup lift and a jib park on an 11-inch base, supplemented by snowmaking and harvesting, but the forecast for four to seven inches of snow Monday didn’t materialize, and the forecast calls for rain, freezing rain and above-freezing temperatures into the foreseeable future. As such the resort will wait for new snow before continuing lift operations. The situation is similar around much of the Pacific Northwest. Outside Bellingham, Washington, the nation’s snowiest ski resort — Mt. Baker — is sitting on a base depth that measures a meager 16 inches at Heather Meadows and 20 inches on Pan Dome. Mt. Baker’s lifts remain silent, as do those at Stevens Pass, The Summit at Snoqualmie and White Pass. Crystal Mountain in Washington, and Oregon’s Timberline and Mt. Bachelor are each offering limited operations. Elsewhere in the Southwest, Taos, N.M. will officially open the season with limited operations on Thursday, followed by nearby Sipapu on Friday and Ski Santa Fe on Saturday, but Sandia Peak above Albuquerque has seen only two inches of snowfall the entire season to date. The storm churning off the Pacific coast has been kinder to Lake Tahoe resorts, at least at higher elevations. At press time a Winter Storm Warning issued by the National Weather Service for the Sierra above 7,000 feet remains in effect until 4 a.m. PST Thursday. Snowfall is expected to continue today with the freezing level hovering between 7,000 to 7,500 feet before tapering to showers overnight. Accumulation of eight to 15 inches is expected above 7,500 feet, especially west of Highway 89. As a point of reference, ski resort base elevations in the region include 6,200 feet at Squaw Valley, 6,540 feet at Heavenly and 6,330 feet at Northstar. Higher elevation Tahoe resorts including Mt. Rose (base elevation 8,260′), Kirkwood (7,800′) and Sugar Bowl (6,883′) could benefit most from this storm. Back East, although the New England interior benefited from the much-hyped Thanksgiving week storm, the Mid-Atlantic continues to experience a roller coaster of weather, making winter operations challenging at the region’s ski resorts. The crews at Wisp, Maryland’s only ski resort, have been working tirelessly to patch the mountain from this week’s rain and mild temperatures. Resort officials have rescheduled Wisp’s opening day to Saturday, Dec. 13, and the inaugural Wisp Benefit Day has been rescheduled for Friday, Dec. 12. All proceeds from Benefit Day ticket sales will go to Garrett Lakes Arts Festival. Tickets cost $20 per person for adults or children 6 and older or 38 inches tall, and include skiing and snowboarding, unlimited snow tubing, ice skating and a mountain coaster ride at the Mountain Park.